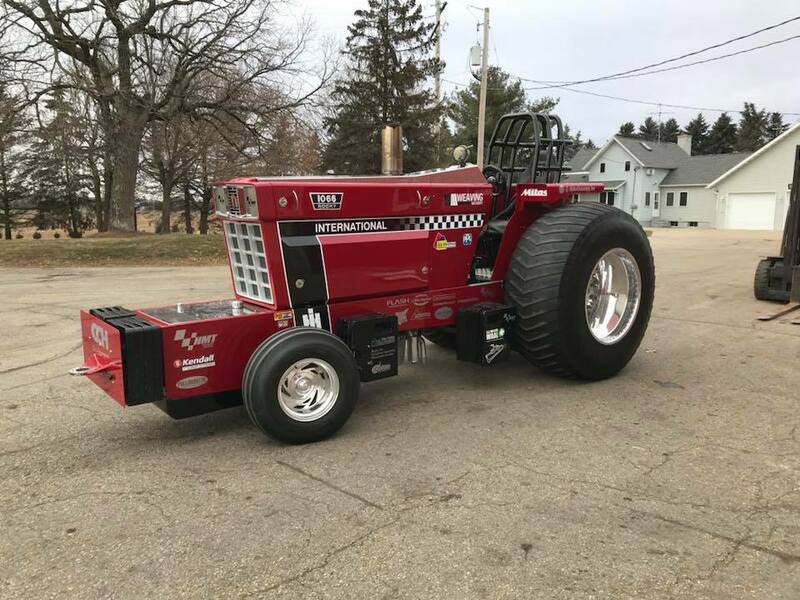 From Salem, Ohio in the USA, the Warpath Pulling Team around Carlton Cope have built a completely new MF 1150 Light Pro Stock Tractor during the last winter. The new Light Pro got a new homemade chrome-moly tube frame with a self built chrome-moly Rollcage, a MF 1150 rearend, a homemade hydraulic power steering, a MF 1150 aluminium hood and original Massey Wheatland fenders. The new Massey Ferguson 1150 aluminium hood was built by Binderlite in Corydon, Indiana. The 1150 rearend has original planetaries carrier housing with costum built Profab planetaries, a stock Profab billet steel differential, a MF ring and pinion gear and Engler Tool & Machine built brake hats, rotors, and calipers. The Tractor also has a original MF transmission case with special made gears and shafts, a stock bell housing and a 12.5´´ inch Crower centrifugal clutch with 4 discs. 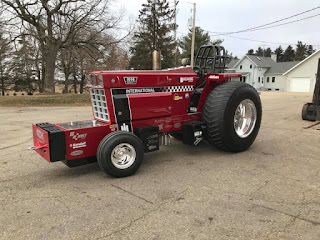 The 1150 rearend, bellhousing, transmission case and axle housings were all custom modified by Profab Machine INC. in Baldwin, Wisconsin. Profab also have built the 3 speed gearbox for the new Vehicle. The Warpath Pulling Team bought for the new one a set of new polished Midwest aluminium rims with new cut Firestone Puller 2000 HP tires. 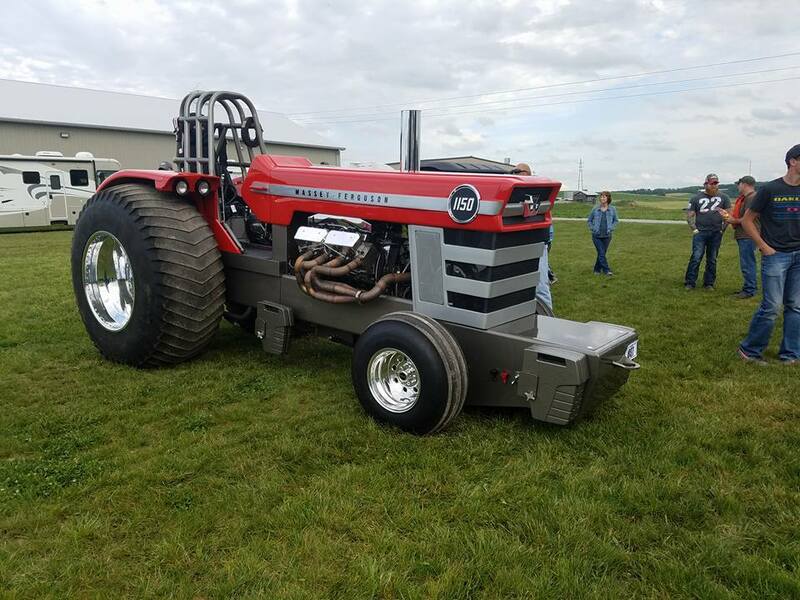 The new Massey Ferguson is powered by a turbocharged Perkins V8 engine with 540cui. on diesel fuel. The new power plant has a original V8 Perkins block with PowerBore sleeves, recast cylinder heads by Lemke Motorsports (New Generation Plus) from Helenville, Wisconsin, Victory valves and valve springs, Perkins camshafts with roller ground by Vogel MFG., a billet crankshaft by SIC (Southern Illinois Crankshaft, INC.), homemade rods and GMS (Gene´s Machine Shop) pistons, a IMCO fuel tank, a 16mm Columbus P-Pump, a Wimer turbocharger, a homemade intake and exhaust manifold, a 3 Stage Aviaid oil pump and a TS Performance data logger. The first runs in 2017 were pretty well of the new Massey. The owner of the new MF 1150 Light Pro Stock is Dennis Goodman from Genoa, Ohio. 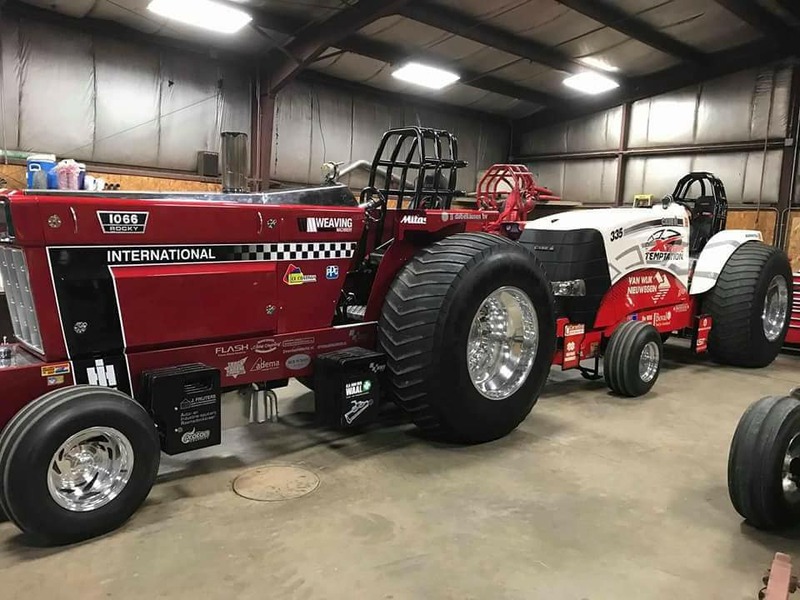 From Ludwigsburg in Germany, the Michi Power Pulling Team around Hans and Michael Hermann have built a new IH Tractor for the 3.5t / 7700lbs. 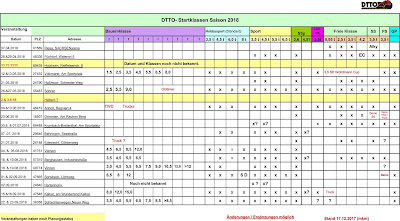 Sport class during the last 1 1/2 years. After the sell of his 600kg Compact Diesel Puller, Hans decided to built a new Tractor for the 3.5t / 7700lbs. Sport class. It's also a return to the big Tractors for him. 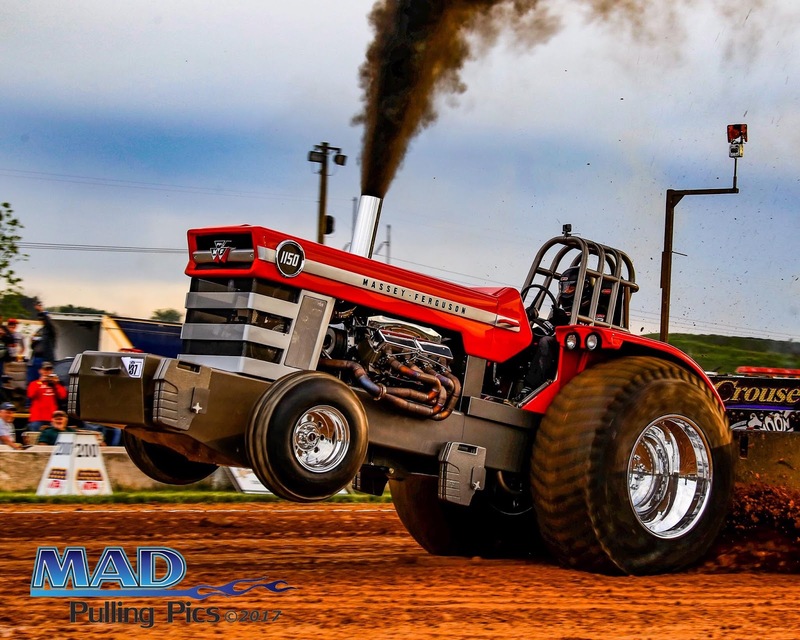 He started his Pulling carrer in the late 80s in the 6t Standard class with a IH 844 Tractor on the DTTO circuits in Germany. He end up a few times on the podium, like in Seifertshofen 1997. 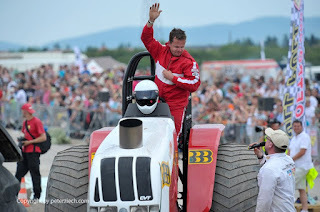 In 1999, he made the switch into the Garden Pulling Sport and won in 2002, 2004 and 2005 the German Championship title and in 2004 and 2006 the European Championship in the 500kg Modified division. Before his switch this year, he ran very competitive in the 600kg Compact Diesel class until 2015. 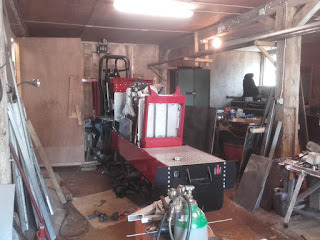 The new Red Obsession has a homemade 4 square steel tube frame with a steel Rollcage, a homemade hydraulic power steering, a IH 1046 hood and homemade aluminium fenders. The 1046 hood was a little bit extended and is hinged now. The rearend of the Tractor is from ZF and has a needle bearing diff with a stock ring and pinion gear, ZF stock halfshafts, ZF stock planetaries, a hydraulic single wheel brake system with homemade brake discs and Brembo brakes of a Dodge Viper. The original gearbox received some better and stronger special made gears from the Netherlands. The centrifugal clutch is a Crower clutch with 3 discs and a size of 11'' inch. In the original IH clutch bell housing was fitted a homemade 12mm steel liner. With this liner, the Tractor can drive without the shatter blanket around the clutch bell housing now. The Team purchased for their Tractor a set of Lemmerz steel rims with Michelin 650x65x38" inch tires. Hans and his Crew modified the rims a little bit, they made the rims lighter. The new Red Obsession is powered by an turbocharged 6 cylinder IH OH 358 engine on diesel fuel. The engine has a IH stock block with IH sleeves, a stock crankshaft with modified IH rods and pistons, a IH OH 358 stock cylinder head with a ungrinded camshaft, original IH valves and valve springs, a homemade exhaust manifold, a modified stock intake manifold, a Garrett HX 55 turbocharger, a MAN Truck Intercooler, a Bosch PE fuel pump with 12mm elements, a Voltcraft 4 channel data logger and a self made diesel fuel tank. Unique on the engine is the Eberspächer heater. With the heater they can preheat the engine before a run. 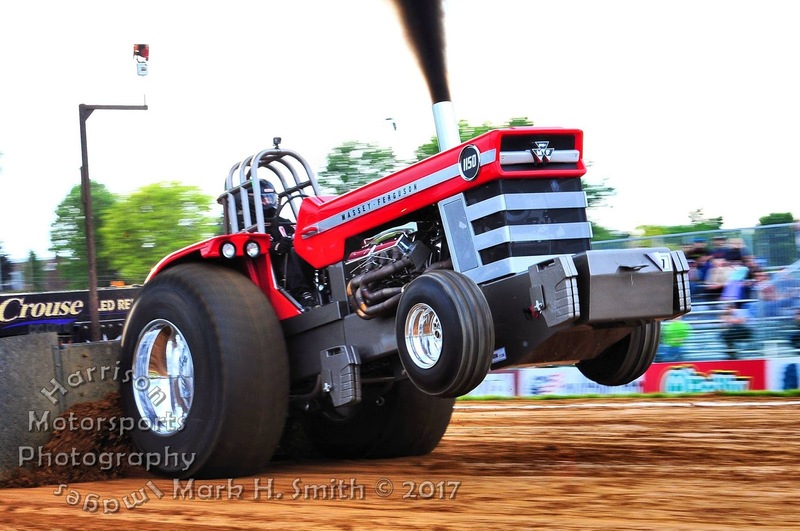 The Michi Power Team made some very impressive runs with the new IH Tractor during the 2017 season. They won the Wohltmann-Landtechnik Cup 2017 in Volkmarst, Germany and also finished few times on the podium. 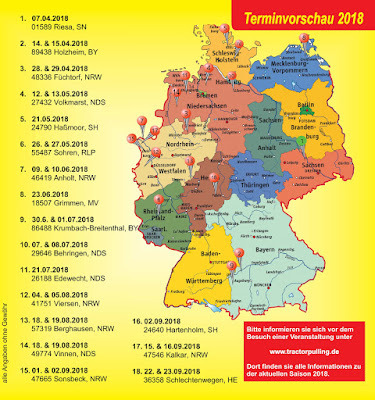 Hans Hermann will compete with his Red Obsession in the German Championship again next year. The old 950kg / 2095lbs. 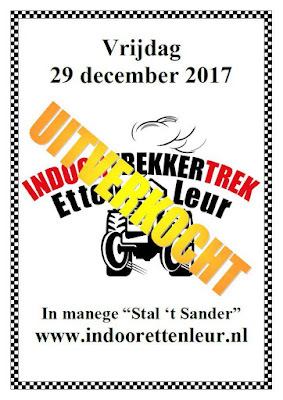 Mini Modified called ,,Little Bandit´´ of the Lucky Ducky Pulling Team from Putten in the Netherlands was sold before christmas to Germany. The Mini was purchased by the Fuchs Oil Miracle Light Pulling Team around Sven Meierjohann from Hipstedt, in Northern Germany. In the complete package were also included the rear wheels, the fenders, the clutch with the bell housing, the Vreeman gearbox and a Keith Black V8 Hemi engine with a SSI 14-71 blower. The Little Bandit was a pretty successful Tractor in the past. The Dutch Team won the Euro Cup and the Dutch Championship title in 2015 with this Vehicle. The new name of the Tractor will be Fuchs Oil Miracle Light 2.0. Further details about the new Toy of the Fuchs Oil Miracle Light Team will follow, check here at pullingworld.com ! Since 2017, the Blue Thunder Pulling Team from Tonden, in the Netherlands are on the road in Europe with a new Transport Truck. 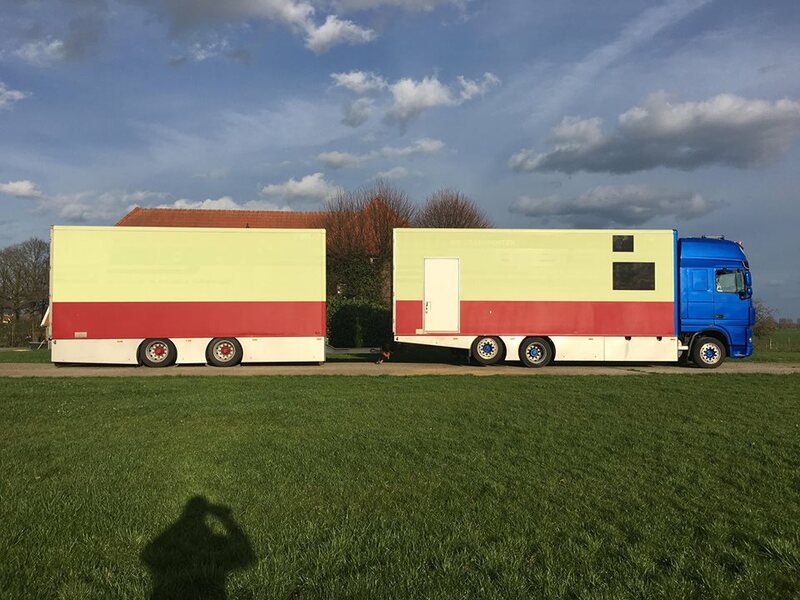 The Dutch Team purchased the used DAF XF Truck with the 2 axle Trailer last year and worked on this new towing vehicle for almost a year until it was comepletely finished. 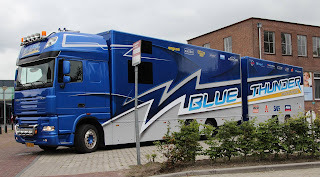 Behind the drivers cab of the DAF Semi is the living room of the Team. In the living room are a little kitchen, a table, bench seats, a toilette and sleeping beds for the whole Crew. In the rebuilt Trailer is enough space for the New Holland Component Super Stock and for the fuel Quad. In the trailer are also all the tools and spare parts for the Tractor. The design and the stickers for the towing vehicle were made by M2id (pullingart) from the Netherlands. Arjan van der Kolk, from Vroomshop in the Netherlands. He´s the driver and owner of the only worldwide Steyr Component Pro Stock Tractor called ,,DPP Rednex´´. 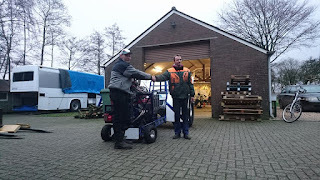 Arjan also making fuel pumps (Dutch Pump Performance Dieseltechniek v.d. 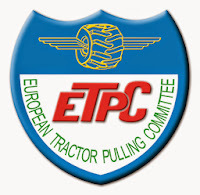 Kolk) for other Pulling Teams in Europe. 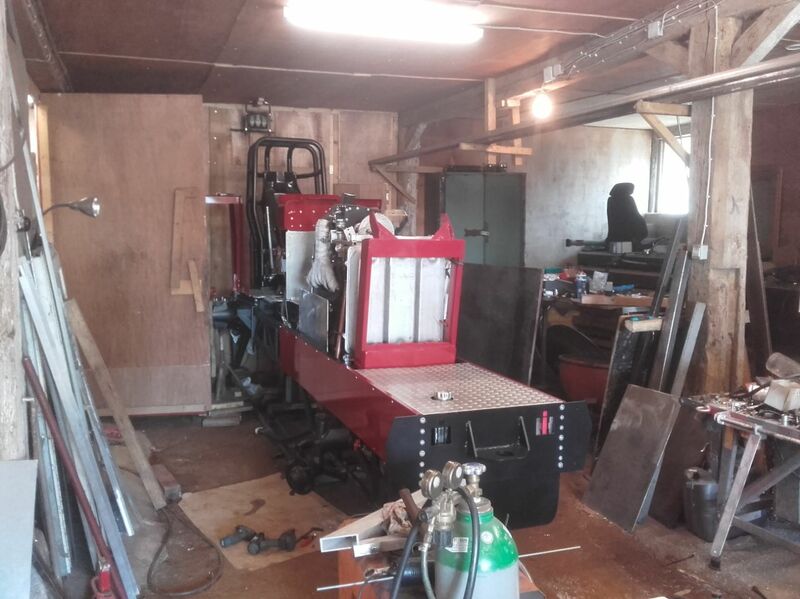 Arjan van der Kolk: I run a diesel shop called ,,DPP Dieseltechniek vd Kolk BV´´. Arjan van der Kolk: The little free time what I have, I like to spend with my Family. Arjan van der Kolk: It’s the best opportunity to test ideas at high level. Arjan van der Kolk: Wierden (NL) somewhere around the mid 80s. Arjan van der Kolk: Lochem (NL). Arjan van der Kolk: Several Grand National wins and podiums. Arjan van der Kolk: Super Sport and Trucks. Arjan van der Kolk: Emmeloord (NL) 2006, rearend broke and after that the engine. Arjan van der Kolk: Nothing major. Arjan van der Kolk: NTTO Grand National Champion in the future. Arjan van der Kolk: First run in NTTO Grand National. Arjan van der Kolk: Building the new Rednex during the last winter. Arjan van der Kolk: Keep enjoying our great sport. 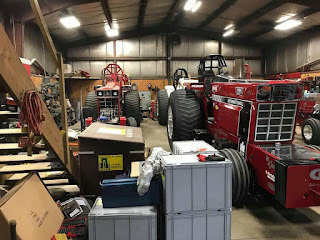 The both European IH Component Pro Stock Tractors called ,,Rocky´´ and ,,Extreme Temptation´´ are safely arrived short before christmas in the USA. 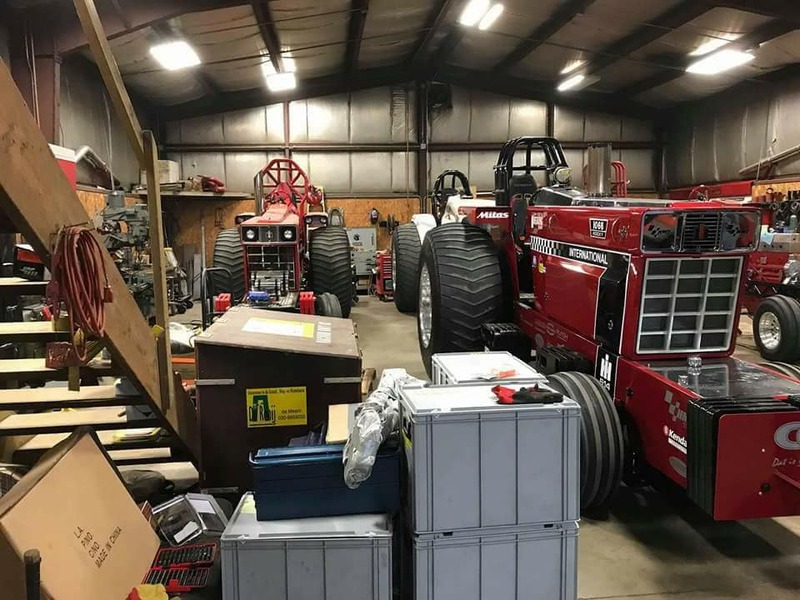 The Dutch Tractors are currently standing in the workshop of the US Limited Pro Stock Pulling Team called ,,Gallitz´´ in Jefferson, Wisconsin. 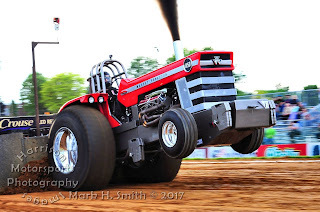 The Gallitz Pulling Team owns 2 IH 1466 Limited Pro Stock Tractors called ,,Runnin´ in the Red´´ and ,,Runnin´ Red Hot´´. The guys were Lucas Oil Pro Pulling League Champions in the Super Farm class in 2010. 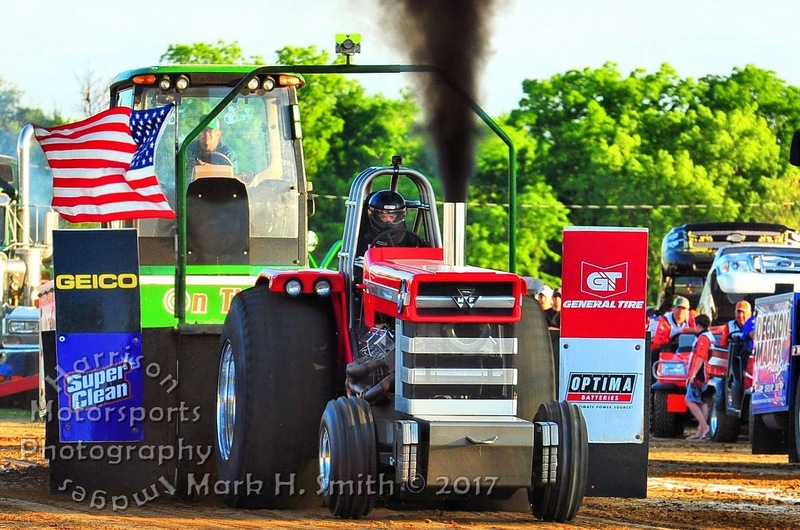 The first stop for the Rocky and the Extreme Temptation Pulling Team will be the Gordyville Indoor Pull in Gifford, Illinois next week. 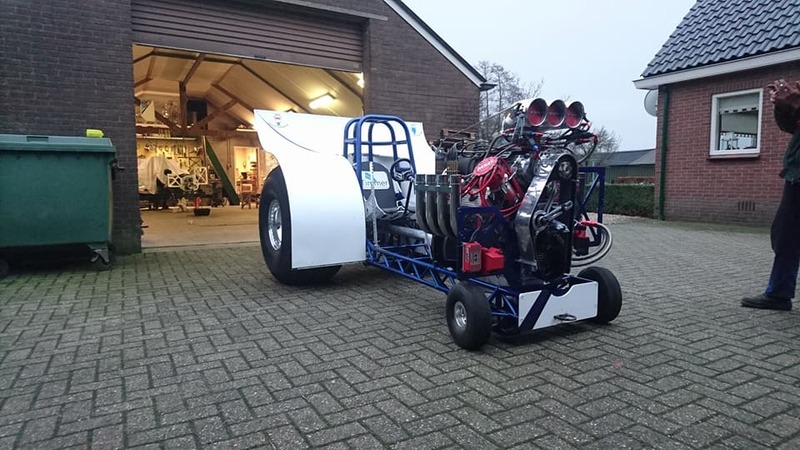 The Dutch Mini Rod team ‘Let’s Try’ out of Dronten has launched something new in the world of Tractor Pulling. The team came up with a brand new team magazine called ‘Hemi Magazine’ and are the very first team to do so. In this digital magazine everything about the team will be written down. ‘The reason for this is that we wanted to move on with the modern world of social media’. ‘We want to go forward. Not only with our tractor but also with our communication towards our fans and of course our sponsors’. So says the purple team. 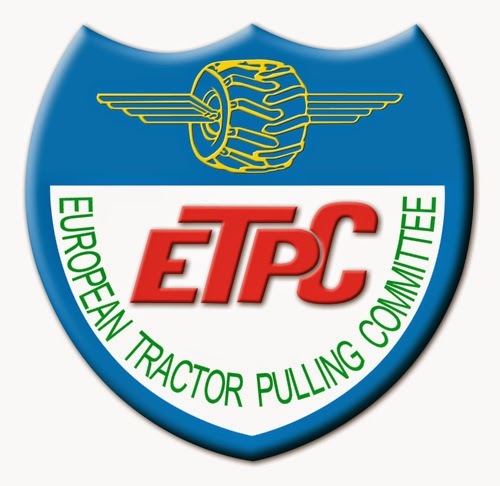 ‘In an online magazine it is possible to write down more information about the tractor, about the technique and the team itself. It just does not work to post a long story on a platform as Facebook for example’. ‘Our sponsors have helped us tremendously this season’ according to the team. 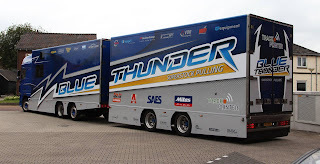 A big backfire at the Power Pull in Made (NL) caused serious engine damage for the small team. To stay on track the team had the replace and repair almost every single component of the engine. Not only the sponsors were there for the team, also people of the Hemi V8 club supported with donations of 50 euros per year. ‘We want to do something for those people as well’. The team goes on: ‘In Tractor Pulling sponsors are very important. 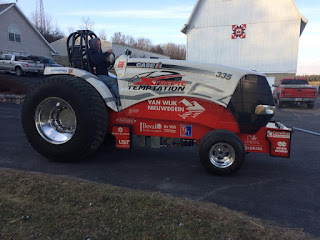 We have a limited space on the fenders of our tractor so we need an other way to present sponsors, a magazine is a perfect solution for that’. 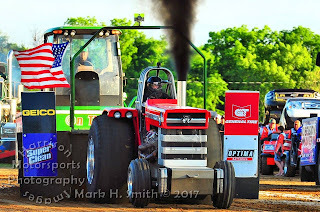 As far as time goes, this is something unique within the NTTO and the Tractor Pulling world. Team Let’s Try is the very first team in Europe to present a complete digital magazine for sponsors and club members. 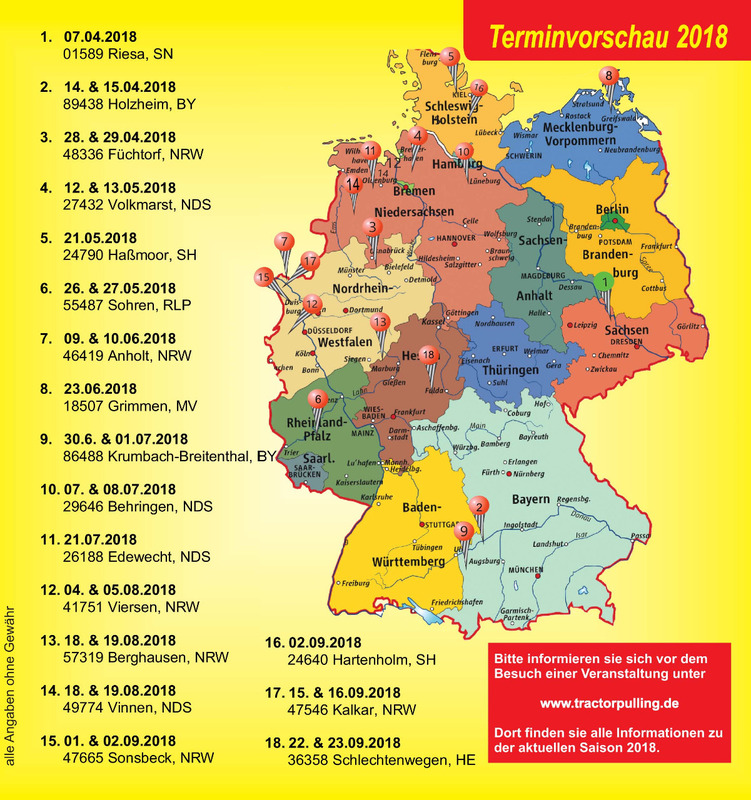 The ETPC has released their Euro Cup schedule for 2018. The Euro Cup will be held on 8 different locations in Europe. 2 rounds are in the Netherlands and 1 each in France, Sweden, Hungary, Great Britain, Germany and in Denmark. 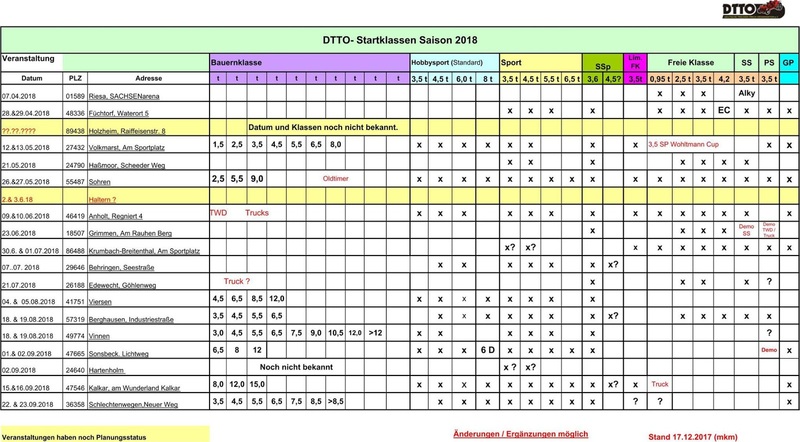 New in the Euro Cup calendar for 2018 is Füchtorf, in Germany with the Heavy Modified class on the programm. The Euro Cup took place for the last time in Germany, in the year of 2000 in Grimmen. Etten Leur Indoor sold out! 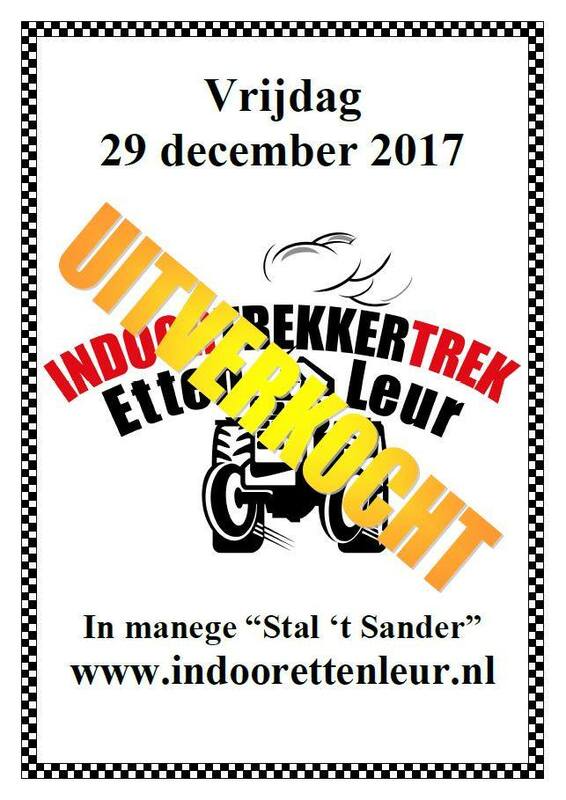 The Indoor pull at Etten Leur is already sold out! If you don't have tickets already, you won't get in anymore. The year is almost over and before I forget it, I would also like to give a big thanks to all the Pulling Teams, drivers and our sponsors for the great support during the 2017 season. Without the information, pictures and the help of the Teams from all around the World, it wouldn't be possible to make a website on this level ! I also hope the great cooperation with the Teams, drivers and our sponsors will continue in 2018! 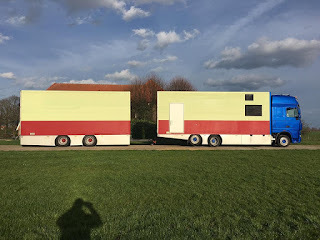 From Bakel, in the Netherlands, the Bad Boys Toy Pulling Team around Rene Manders are currently building a new 3.5t / 7700lbs. 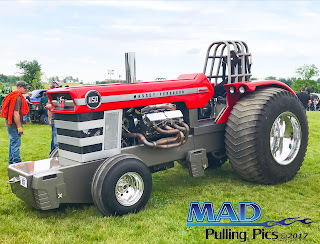 Massey Ferguson Component Pro Stock Tractor. After many years with balance and weight problems, the Team decided to built a completely new Pro Stock on Component base in 2012. Without the MF stock rearend, the original gearbox and the standard bell housing, the Team save a lots of weight. With those changes, they have more movable weight on the new Tractor. The calculations of the Team said, the new one will be around 500kg lighter than the old one. After less time during the last years, the Bad Boys Toy Team set the Component Pro Stock project on ice for 3 years. In the end of 2016, after the sell of their old Bad Boys Toy Tractor, they continued with the building process of the new MF Component Pro Stock project. 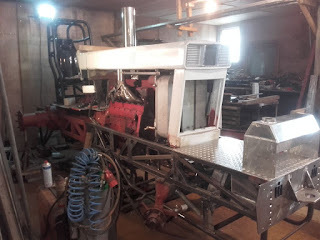 The Pro Stock Tractor receives a chrome-moly tube frame with a new homemade chrome-moly Rollcage, a self built hydraulic power steering, a Rockwell rearend, a homemade hitch, a MF 1150 hood and homemade MF glass fibre fenders. 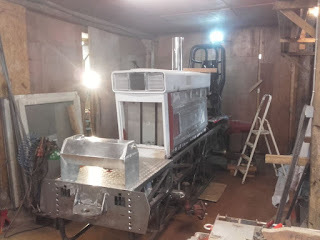 The new hood of the Tractor isn´t a original MF 1150 hood. The hood is a copy of the MF 1150 and was built in their own workshop in Bakel. They built that hood from glass fibre. The glass fibre hood is wider and much lighter than the original sheet metal hood. 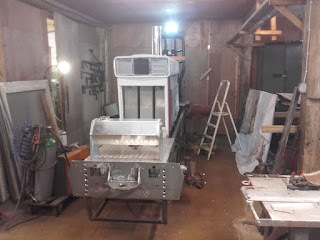 The Chassis comes from the old single Rolls Royce Griffon V12 powered Light Modified Tractor called ,,Le Coiffeur Stage 6´´ of Frank Bartholome. They purchased the Chassis from Frank Bartholome in 2011. 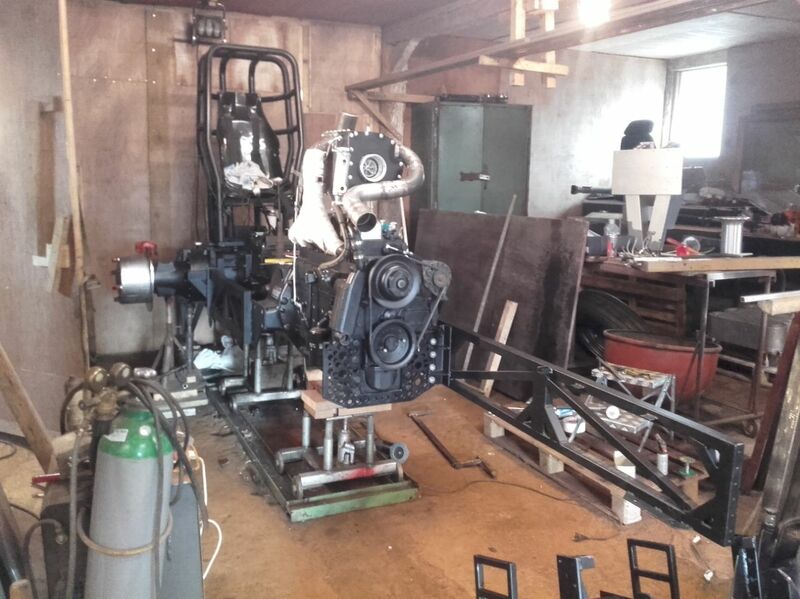 During the building periode, the guys made a lots of changes and improvements on the frame. It´s not a lot, what has left over of the old Le Coiffeur frame, only the side tube frame rails are left over of the frame. The Rockwell rearend was shortened and gets a Rockwell center section with a stock needle bearing differential, a Rockwell ring and pinion gear, stock ZF planetaries carrier housing with original ZF planetaries and homemade brake discs with Van der Waal Pulling Parts brakes. The rear wheels on the new Vehicle are a set of used polished Midwest aluminium rims with new uncut Firestone Puller 2000 HP tyres. The Bad Boys Toy Team purchased the tyres from the John Deere Pulling Team in Denmark. The Team have planned for the first season to drive with the uncut tyres on the Pulling tracks. The MF also receives a new constructed homemade 3 speed gearbox, a new Van der Waal Pulling Parts built driveline, a Van der Waal Pulling Parts 11´´ inch centrifugal clutch with 5 Crower discs, a homemade steel fly wheel and a Browell steel clutch bell housing of the former turbocharged twin Allison V12 powered Heavy Modified Tractor called ,,Alley Cat´´ from the Netherlands. The new gearbox gets a homemade CNC-milled aluminium housing with Fuller gears, newly built shafts and has 3 forward gears and 1 reverse gear. All the calculations for the newly constructed gearbox were made by the Bad Boys Toy Team himself. The new Component Pro Stock will have a new turbocharged Perkins V8 engine with 510cui. / 8.3l capacity on diesel fuel. The engine has a Perkins stock block with Darton sleeves, a new balanced Perkins crankshaft with original steel rods and homemade aluminium pistons, revised Perkins cylinder heads with billet steel camshafts, a homemade intake and exhaust manifold, a billet Holset HX82 turbocharger with a 5´´ inch intake wheel from the Rocky Pulling Team, a new aluminium Intercooler, a self built sheet metal fuel tank, a Sigma fuel pump with 17mm elements, a Aviaid oil pump and a new data logger. 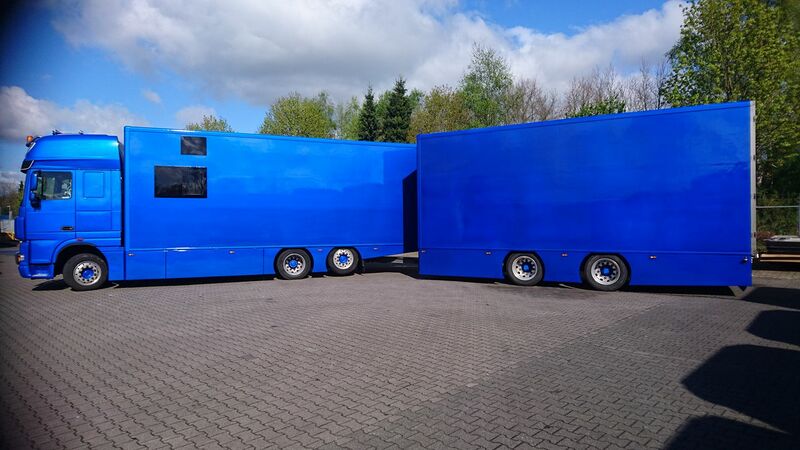 The new Intercooler was built by their sponsor ERF Heating & Cooling Solutions in Eindhoven, the Netherlands. For the future are planned to built new stronger homemade Toolox rods for the engine and new lighter built planetaries carrier housing from aluminium. The Bad Boys Toy Pulling Team will compete in the Dutch National Championship next year. The maiden voyage of the Bad Boys Toy Component Pro Stock Tractor is planned for 2018. 2018 NFMS Pull competitors are known !